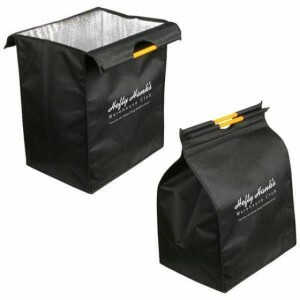 If you are looking for an extra large insulated grocery bag, then we have the perfect bag for you! Our Jumbo Insulated Recycled Grocery Bag is HUGE! As the name implies, its made from recycled PET and is perfect for catering companies, restaurants and bakeries, delivery services, and markets that need a bag that will hold boxes or many items, while keeping them cold and fresh! It would also be a great alternative to a hard-sided cooler for picnics and the beach. In addition to its size, there are many other great features of this bag. It has a sturdy Velcro closure that keeps the contents well-insulated and inside the bag (not all over the floor!). Our staff member said that the handles held up great to lots of use and heavy jobs. Plus–it folds flat for easy storage! The downside to this bag is that it only comes in black. It also may be actually TOO large for some of our clients. The bigger the bag, the heavier it can become when packed full. We recommend a sample of this one before committing to your order.